The Barkan Method is a style of Hatha Yoga that originated from a lineage in Calcutta, India. The Barkan Method finds its roots from this lineage in Calcutta, but also integrates postures from other styles of Yoga to create variations and even greater range of motion. The yoga classes are practiced in a heated room to stretch and strengthen various areas of the body. The practice brings vital balance and restores all systems to optimal health. Consistency will create a physical, mental and spiritual harmony that will be felt in all areas of the practitioner’s life. The PHYSICAL: The yoga asanas are designed to work internally and externally. Internally, improvements to the heart, spleen, kidneys, liver, and intestines are realized through consistent practice. Externally, the joints, muscles, tendons, and ligaments are all made stronger through The Barkan Method. The MENTAL: As in all forms of yoga, the mind is strengthened through the discipline of The Barkan Method, which helps to eliminate stress, depression, anxiety, and other dysfunctional mental disorders. The Barkan Method helps to create a calming of the mind, quieting of the brain’s chatter, and deep relaxation response. The SPIRITUAL: As we strengthen the body and calm the mind, we open ourselves up for a transformational experience. The Intention behind the Barkan Method is to balance and body, quiet the mind and nourish the soul. 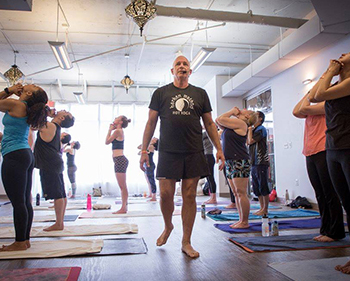 Jimmy Barkan’s rich experience in teaching of people of all ages, abilities and body types makes him the perfect instructor to help you reach a new depth in your poses, as well as your consciousness.